Line a 9 inch square metal pan with non-stick foil or line with regular foil and grease foil. Preheat oven at 180°C (350°F). Put the sugar and butter into the bowl of a food mixer and beat for several minutes till white and fluffy. By hand is okay, but it’s important to beat until very light and fluffy. I used a stand mixer and beat for a good 4 minutes. Meanwhile, break the chocolate into pieces, set (2 oz.) of it aside and melt the rest in a bowl suspended over, but not touching, a pan of simmering water. As soon as the chocolate has melted remove it from the heat. Chop the remaining 50g into gravel-sized pieces. Or, melt your chocolate in the microwave. In a small bowl, beat the eggs lightly with a fork. Sift together the flour, cocoa and baking powder and mix in a pinch of salt. With the mixer running slowly, add the beaten egg a little at a time, speeding up in between additions. Remove the bowl from the mixer to the work surface, then mix in the melted and the chopped chocolate with a large metal spoon. Lastly, fold in the flour and cocoa, gently and firmly, without knocking any of the air out. Scrape the mixture into the prepared pan, smooth the top and bake for 30 minutes. After 30 minutes the top will have risen slightly and the brownies should appear softer in the middle than around the edges. Pierce the center of the cake with a fork - it should come out sticky, but not with raw mixture attached to it. 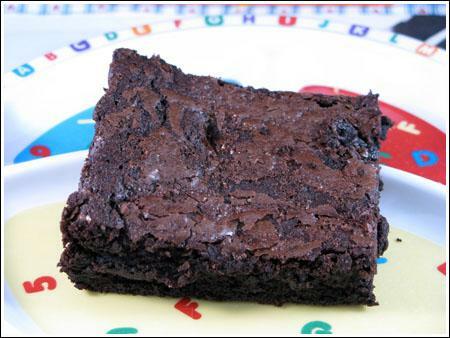 If it looks raw, don’t worry because the brownies will solidify as they cool. Mine tested almost raw at 30 minutes. I put them in for another 4 then took them out to cool. They set up perfectly with a light skin and “peat bog” like texture. So total time for me was 34 minutes.